Evidence based research for the improvement of mental health. 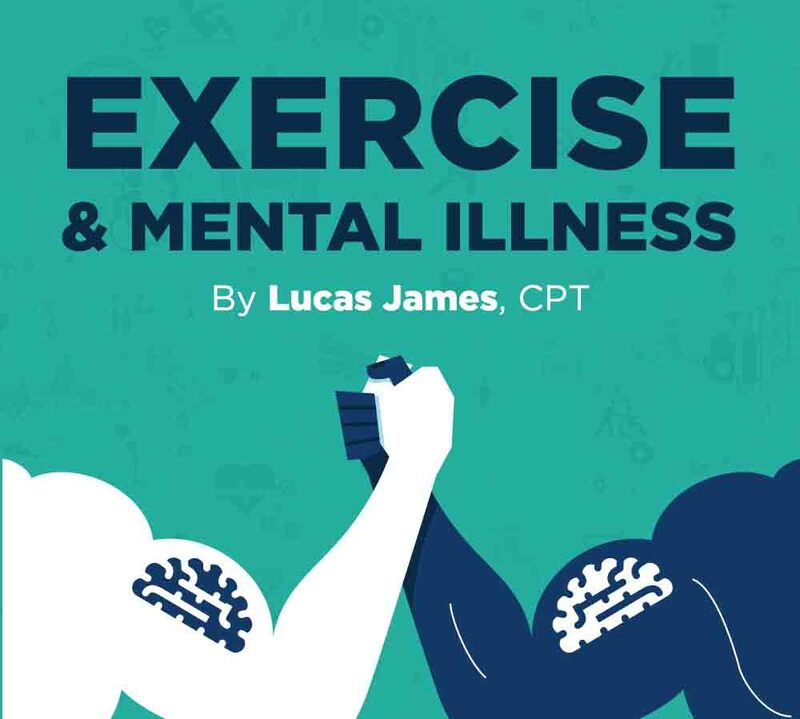 Regular exercise benefits the body physically, but not everyone is aware that exercise is one of the most powerful ways to improve mental illnesses. Mental health is our emotional, psychological, and social wellbeing that determines how we handle stress, relate to others, and make choices in our day-to-day lives. It turns out that physical health and mental health are deeply intertwined with each other. On average, people with poor mental health have a higher prevalence of depression, anxiety, ADHD, stress, Alzheimer’s disease, and other serious chronic disease risk factors. Before seeking medication, researchers now show regular physical activity as one of the most effective treatments for mental health challenges. Depression is the persistent feeling of sadness or loss of interest in daily activities. Biologically, depression has been linked to imbalances of serotonin (mood regulation), norepinephrine (stress hormone), and dopamine (reward and pleasure center) in the brain (2). The therapeutic value of exercise training not only balances out the biological factors, but has also proven to increase self-efficacy, a sense of mastery, distraction from negative thoughts, and changes in self-concept (1). Studies have shown if you participate in 3-4 training sessions a week for at least 30 minutes each session, you can reduce depressive symptoms (6). There are benefits for individuals who consistently workout. One, consistent exercise is associated with less symptoms of depression spanning up to 10 years and two, a steady 16 weeks will have the same effect as antidepressant medication (3,5,8). However, it is important to exercise at 70% of your max heart rate in order to receive the best results (6). There are many types of exercise individuals can participate in both exercises proven to reduce depressive symptoms are walking and/or running on the treadmill, weightlifting, and yoga (3,7). Group exercise also has benefits due to the socializing aspects and moral support from others (4). Anxiety is the feelings of worry, anxiety, or fear that interfere with one’s daily activities. Physical exercises and mindful activities have been proven to improve mood stabilization (16). More specifically, aerobic exercise (often known as cardio) produces many of the same bodily sensations that often elicit anxiety reactions such as increased heart rate, respiration, and perspiration (12). Repeated exposure to those anxiety-related stimuli through exercise can extinguish fear responses along with how individuals interpret those stimuli (12). Moderate to high-intensity exercise 3-4x a week for a duration of 30 minutes plus with 70% of your maximum heart rate has been proven to give the best results (9,11,14). One study found that with the 10-week mark exercise can be just as effective as pharmacotherapy (10)! Following each and every workout, individuals will feel temporary releases of psychological distress (13). Yoga and tai chi has also shown therapeutic effectiveness by refining tranquility and revitalization (13,15). Evidence also suggests that exercise may be biologically necessary to keep anxiety at healthy levels in general (12). Everyone feels stressed from time to time and that is completely normal! Stress is actually essential for survival, but chronic stress, on the other hand, can cause many serious health problems. There are many known techniques for reducing stress, but the most significant one is physical activity. By being physically active every day, it will help combat the negative responses we receive by being exposed to stressful environments (17). Exercising has a positive effect on our brain endorphins, which are known as the body’s natural painkillers. When stress affects the brain, it also affects your body as well. Researchers have found that regular exercise has been proven to decrease individuals overall tension and elevate and stabilize mood, which results in stress reduction (18). Any form of exercise can act as a stress reliever so get moving! ADHD (also known as attention deficit/ hyperactivity disorder) is a condition, including attention difficulty, hyperactivity, and impulsiveness. Numerous studies have shown that physical exercise is a promising alternative to stimulant medication and/or therapy for individuals with AHDH (19). Although all types of exercise activities show mild improvements, 20 minutes of moderate intensity cardio exercise seem to be the most beneficial for both behavior and cognitive functioning (20). In one study immediately after cardio exercise, impulse control, concentration, motivation, processing speed, and attentiveness were improved (20). There are many different types of cardio activities individuals can participate in but to give a few examples, there is running, cycling, dancing, rowing and swimming. Alzheimer’s disease (AD) is a progressive disease that impairs memory and other important mental functions. Genetic factors are known to play a role in the vulnerability of Alzheimer’s, but less that 1% are directly linked to genetic factors, which implies that environmental aspects play a role in most cases (22). Researchers have been investigating the association between physical activity and the risk of Alzheimer’s and the findings are really interesting! Two major risk factors for developing AD is a history of severe life stressors and cardiovascular disease (21,22). As mentioned above, physical activity does a great job at reducing stress and it also is fantastic for cardiovascular disease! As we age, regular physical activity becomes vital to promote changes in brain structure and mental function. For individuals already diagnosed with AD, depression is among the most frequent symptom observed (24). Depressed individuals can present loss of interest and lack of motivation to engage in physical/cultural/social activities, which increase the likelihood of being sedentary both at home and in society (24). One study recommends individuals that get little to no physical activity should aim for 6,000-6,5000 steps per day (24). Another study suggests moderate-intensity cycling on a stationary bike for 10-35 minutes 3 times a week has been proven to increase cognition and improve executive functioning in older adults with mild AD (23). It is important to integrate yourself or loved ones into physical activity programs because it improves cognitive function, encourages social contact, increases body stimulation, and improves the overall quality of life (24,25). Following the positive effects of mental health and physical activity, regular exercise can boost your creativity too! Creativity is a combination of concepts that exist in the human mind that are hidden in the subconscious, which can be activated as needed (26). Walking has been shown to open up a free flow of ideas and it is a simple and healthy solution to any goals of increasing creativity and physical activity (27). Researchers compared the total ideas produced in a study between people walking and sitting. They found that participants who walked yielded 50% more ideas than those that did not (28). This is a great tool to improve one’s performance right before a brainstorming session and has shown that from immediately after aerobic exercise people demonstrate greater creativity potential up to two hours (28). It does not matter where you take a walk on whether it is an urban or rural area, but the outdoors can offer cognitive and emotional renewal as a bonus. A walk in nature, presented a restore in individual exhausted attention capacities and as a result, they had improved performances at difficult cognitive tasks (28). Overall, aerobic activity increases the speed of concurrent cognition and creativity seems to be more developed in people who regularly participate in physical activity (26,3). Overall, physical activity is one of the best modifiable factors for the prevention of cardiovascular disease and a longer life expectancy (30). Some individuals tend to over exercise thinking that they are doing well for their body, but in turn, it can put added stress on your body. Exercising more than 100 minutes a day is not necessary because it does not appear to be associated with additional reductions in mortality rates (30). Some of you are probably thinking, “how does anyone have time to work out for 100 minutes?” which is understandable. As humans, we sometimes get too caught up in work, relationships, children, and other responsibilities that we forget to take the time to take care of ourselves. Even with a busy lifestyle, you should always invest some time in yourself by squeezing in a workout. One study shows that a minimal 5-10 minute run a day can reduce mortality from all causes and cardiovascular disease and even add 3 years of life expectancy (29). Now, what’s your excuse? Running is a far better option for time efficiency. For example, a 5 minute run is as good as a 15 minute walk and a 25 minute run can generate benefits that would require 4 times longer to accomplish by walking (29). A tip to yielding more favorable effects on mortality and disease risk is to participate in higher intensity workouts if possible. If running is not an option for you, a 15-minute brisk walk has been proven to reduce mortality from heart disease by 25% (29). The takeaway message is clearly stated and shown; physical activity is extremely important for not only our physical health but our mental health as well. Be consistent, make it a habit and only good things will stem from there.